Patrick Henry was one of the founders of the United States and he is remembered especially for his dramatic phrase “Give me liberty, or give me death”. We came across this statement at the same time we were trying, thinking about and deciding, weather to open Son of a Punch’s first cocktail bar. This was back in 2011 and what we wanted to achieve was a cocktail revolution, and this phrase was just perfect. The phrase was perfect to the cocktail revolution that we wanted to achieve in 2011. 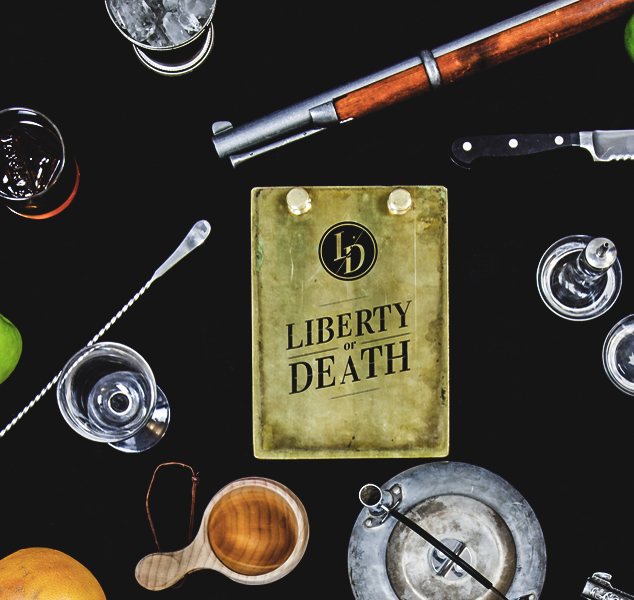 Liberty or Death is the very first bar that our gang ever opened as our own. It is an innovative cocktail getaway in the heart of the Helsinki Design District, Erottajankatu 5. Personalized service, frequently changing menu, experimental vessels, whiskey on a tap and a Brooklyn style atmosphere makes the venue very attractive. The bar opened its doors for the first time in March 2012. The cozy, urban and industrial venue welcomed all the cocktail lovers for a sip or two. From that moment to this date there has been an incredible number of events, hundreds of nights, thousands of drinks, and one thing has not changed: “we pursue to create a unique and exceptional experience with cocktails and service”. It is our goal and we enjoy it every day and have a lot of fun doing it! Our mission is to be revolutionary and we do this by introducing innovative, fresh, new and groundbreaking cocktails in a seasonal form/Cycle. We value ecological thinking and try to bring this to our day to day operations. We acknowledge that with our small decisions we can make a difference in the world and maybe even make possible that our offspring’s have the possibility to enjoy cocktails. We have stopped using plastic straws and try to prepare as much ingredients by ourselves that possible. This way not only we can make sure that the quality is the best possible but also that we throw loss ingredients as low as possible. A bunch of young cocktail culture enthusiasts whose mission is to spread the joy of the cocktail! For us, it is our duty to stay up to date with current trends around the world and to introduce and more importantly to share these phenomena to our guests and fellow cocktail enthusiasts. We’re in this for love and passion. This is not our job; it’s our privilege, and our lifestyle. Obstacles are part of the journey and we try to embrace each and every one of them. During our path, we have come a cross with plenty of challenges just to name a few; getting license to this venue, renovation delayed, water damage, broken equipment’s and tools the list goes on. But as from day one we decided that we are not going to let these obstacles to distracted us or put us down. Rather make us stronger and better prepared for the future. While the others are thinking about it, we have already done it. While the others try to do it, we do it better. The courage and the bravery next to honor are our tools for making things happen.